AFRICAN ACADEMY is one of the rising stars of Cummings Racing and has thrived in the early stages of his career at Leilani Lodge. He is by the superstar TURFFONTEIN who won the Gr1 Sir Rupert Clarke Stakes, Gr1 William Reid, G2 QLD Guineas as well as multiple placings in well renowned sprinting events such as the Gr1 Patinack Classic, Gr1 Doomben 10000, Gr2 Hobartville Stakes, Gr2 Caulfield Sprint & Gr2 Sallinger Stakes for the Cummings team. Turffontein raced in an era that boasted a lot of depth throughout the Australian Carnivals and he beat champions like All American, Wanted, Light Fantastic, Nicconi and Royal Discretion. As a son of Turffontein, African Academy has shown a real will to win and after being patiently prepared won impressively at Hawkesbury over the mile. He was put into a forward position by Blake Shinn and when they straightened let down with a powerful sustained run to keep the challengers at bay. Blake Shinn stated “he felt really good with this race providing a strong staying test. He maintained a long sustained run and won with authority”. The 3YO colt has been very consistent since debuting late last year finishing no worse than 4th from 6 starts and collecting over $40,000 in prizemoney for his connections. The pale blue with red stars of The Surfing Cowboys Polo group is heavily associated with the stable and the Murphy family provide great support for Cummings Racing. Their other representative is the 2YO Uncle Mo filly Sister Sledge who had a taste of racing at Group level finishing 3rd in the Gr2 Reisling Stakes behind Golden Slipper winner Estijaab. 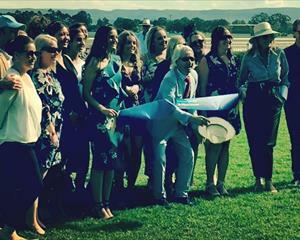 African Academy was bred by the Murphy family on the banks of the Hawkesbury River at Archerfield Farm so it is fitting that he broke his maiden status at the Hawkesbury Race Course. 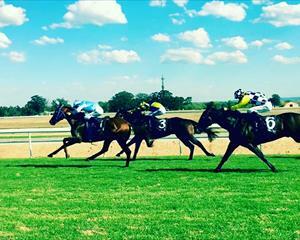 Anthony and Edward commented that “the colt is progressing nicely and has continued to improve since breaking through at Hawkesbury. He will be aimed at the BM70 Handicap at Canterbury Park over the 1550m on the 23rd May”.